Fiveways is a locality in Brighton high up on a hill above the city and centred around the intersection of Preston Drove and Ditchling Road. It is an area renowned for the number of Artist residents living and working closely together. In May, as part of the Brighton Festival and also at Christmas we open our houses as galleries to show curated exhibitions of our own and others work. 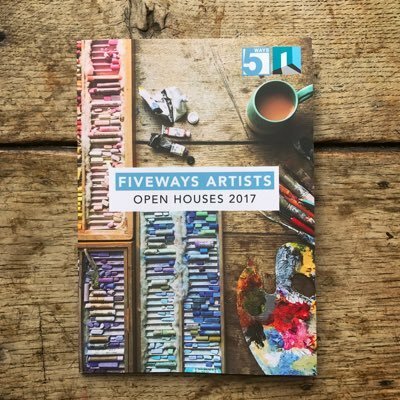 You can explore the latest Fiveways Artists Open House brochure on the website. But Fiveways Artists Group is more than open houses; it is a mutually supportive group of professional Artists who work all year round. A diverse group of ceramicists, photographers, illustrators, textile artists, makers and painters representing all strands of creative practice. To find out more about our work and perhaps commission an Artist do explore the profile pages and follow us on Twitter. If you are an Artist living in Fiveways and the surrounding area we a friendly group and welcome new members including Associate Members who are practising Artists but do not open their house during the Brighton Festival. In 1982 Ned Hoskins filled his home with his and other artists work in protest at the lack of visual arts in the Brighton Festival. Ned had started a new phenomenon. This became the now well known Fiveways Artists Group, named after the area of the city known as Fiveways. They were soon followed by other groupings of Artists’ Open Houses in other areas around Brighton and Hove, including Beyond The Level, founded 1996 (from city area The Level) and Kemptown Artists (from city area Kemptown). In 2008 there were around 1000 artists exhibiting work in over 200 houses, divided into 13 trails, together with many independent open houses. In 2002 the Artists Open Houses Festival broke away from the official and fringe Brighton Festivals to become an independent organisation, often simplified to just AOH, producing its own brochure and website.